Over 120 invited lectures given. But they are not posted here due to the confidential agreement with the private industry. 1. Park, J.W., Keeton, J.T., Lanier, T.C., and Hamann, D.D. 1985. Treatment of prerigor salted beef with cryoprotectants during frozen storage. Abstract #43. Presented at the IFT Annual Meeting, Atlanta, GA. June 9-12. 2. Park, J.W. and Lanier, T.C. 1986. Combined effects of phosphates and sugar or polyols on stabilizing fish muscle proteins during frozen storage. Abstract #457. Presented at the IFT Annual Meeting, Dallas, TX. June 15-18. 3. Park, J.W., Korhonen, R.W., and Lanier, T.C. 1986. Effects of rigor mortis on gel-forming properties of surimi and minced fish prepared from tilapia. Abstract #458. Presented at the IFT Annual Meeting, Dallas, TX. June 15-18. 4. Park, J.W. and Lanier, T.C. 1987. Calorimetric study to monitor the development of rigor mortis. Abstract #516. Presented at the IFT Annual Meeting, Las Vegas, NV. June 16-19. 5. Park, J.W., Lanier, T.C., and Green, D.P. 1987. Cryoprotective effects of sugar, polyols and/or phosphates on Alaska Pollock surimi. Abstract #237. Presented at the IFT Annual Meeting, Las Vegas, NV. June 16-19. 6. Park, J.W., Lanier, T.C., and Pilkington, D.H. 1988. Cryostabilization of functional properties of prerigor and postrigor beef muscle. Abstract #556. Presented at the IFT Annual Meeting, New Orleans, LA. June 19-22. 7. Park, J.W. and Lanier, T.C. 1989. Calorimetric measurement of thermal denaturation of surimi as affected by sugar and/or salt. Paper #548, presented at Annual Meeting of Institute of Food Technologists, Chicago, IL. 8. Park, J.W. and Lindwall, W. 1990. Practical application of surimi and other functional ingredients to least cost linear program. Paper #396, presented at International Chemical Congress of Pacific Basin Societies, Honolulu, Hawaii. 9. Howe, J.R., Hamann, D.D., and Park, J.W. 1991. Influence of test temperature and strain rate on fracture properties (texture) of surimi gels. Paper #630, presented at Annual Meeting of Institute of Food Technologists, Dallas, TX. 10. Park, J. W. 1993. Study of protein additives in surimi-based gels. Paper #115, presented at Annual Meeting of Institute of Food Technologists, Chicago, IL. 11. Yongsawatdigul, J., Park, J.W., Kolbe, E., and Morrissey, M.T. 1994. Ohmic heating of Pacific whiting surimi. 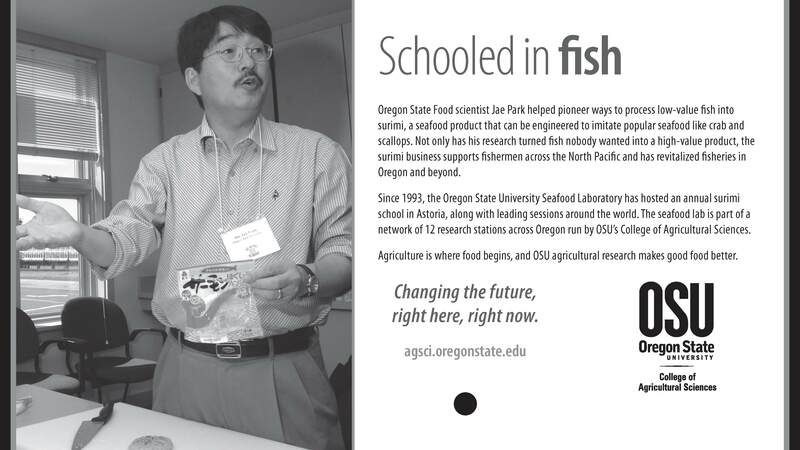 Presented at the 45th Annual Meeting of Pacific Fisheries Technologists, Feb. 6-9. Kodiak, AK. 12. Lin, T.M., Park, J.W., and Morrissey, M.T. 1994. Recovery and utilization of proteins from Pacific whiting surimi processing washwaters by micro- and ultrafiltration. Presented at the 45th Annual Meeting of Pacific Fisheries Technologists, Feb. 6-9. Kodiak, AK. 13. Kolbe, E., Yongsawatdigul, J., Y., AbuDagga, Y., Liu, D., Park, J.W., and Morrissey, M.T. 1994. Use of ohmic heating to process Pacific whiting. Presented at the 45th Annual Meeting of Pacific Fisheries Technologists, Feb. 6-9. Kodiak, AK. 14. Park, J.W. 1994. Effects of compositional and physical conditions on the colors of Alaska pollock and Pacific whiting surimi gels. Abstract #57-2. Presented at the IFT Annual Meeting, Atlanta, GA. June 25-29. 15. Yongsawatdigul, J., Park, J.W., Kolbe, E., Morrissey, M.T., and AbuDagga, Y. 1994. Minimization of gel-weakening (modori) in Pacific whiting surimi by ohmic heating. Abstract #10-3. Presented at the IFT Annual Meeting, Atlanta, GA. June 25-29. 16. Lin, T.M., Park, J.W., and Morrissey, M.T. 1994. Protein recovery and water recondition from surimi processing wash water. Abstract #10-4. Presented at the IFT Annual Meeting, Atlanta, GA. June 25-29. 17. Yongsawatdigul, J., Kolbe, E., Park, J.W., Morrissey, M.T., and AbuDagga, Y. 1994. Electrical conductivity of Pacific whiting surimi during ohmic heating. Abstract #71D-2. Presented at the IFT Annual Meeting, Atlanta, GA. June 25-29. 18. Lin, T.M. and Park, J.W. 1995. Effects of ionic strength and washing cycle on the solubility of myofibrillar proteins during surimi processing. Presented at the Pacific Fisheries Technologists Annual Meeting, Mazatlan, Mexico, Feb 5-8. 19. Park, J.W. 1995. Rheological properties of fish protein gels upon cooling, reheating, and freezing. Presented at the Pacific Fisheries Technologists Annual Meeting, Mazatlan, Mexico, Feb 5-8. 20. Park, J.W. 1995. Fracture properties of fish protein gels at various test temperatures. Abstract #35-6. Presented at the IFT Annual Meeting, Anaheim, CA, June 3-7. 21. Park, J.W. 1995. Use of konjac to form temperature-tolerable fish protein gels. Abstract #54D-5. Presented at the IFT Annual Meeting, Anaheim, CA, June 3-7. 22. Lin, T.M. and Park, J.W. 1995. Solubility of myofibrillar proteins during surimi processing: Effects of ionic strength and washing cycle. Abstract #54D-7. Presented at the IFT Annual Meeting, Anaheim, CA, June 3-7. 23. Yoon, W.B. and Park, J.W. 1995. Least cost linear programming (LCLP) for surimi-based seafood. Abstract #54D-8. Presented at the IFT Annual Meeting, Anaheim, CA, June 3-7. 24. Pipatsattayanuwong, S. Park, J.W., and Morrissey, M.T. 1995. Functional property and shelf life of fresh surimi from Pacific whiting. Abstract #35-3. Presented at the IFT Annual Meeting, Anaheim, CA, June 3-7. 25. Yongsawatdigul, J. and Park, J.W. 1995. Effects of heating rate on gelation of fish proteins from Pacific whiting and Alaska pollock. Abstract #35-4. Presented at the IFT Annual Meeting, Anaheim, CA, June 3-7. 26. Jang, W.Y., Kim, B.Y., and Park, J.W. 1995. Prediction of viscoelastic properties of soybean curd (tofu) during storage using WLF equation. Abstract #93A-10. Presented at the IFT Annual Meeting, Anaheim, CA, June 3-7. 27. Kim, H.J., Kim, B.Y., and Park, J.W. 1995. Rheological properties of soybean curd (tofu) as affected by processing conditions. Abstract #93A-11. Presented at the IFT Annual Meeting, Anaheim, CA, June 3-7. 28. Santos, M.R., Huang, L., Singh, R.P., Park, J.W., and Morrissey, M.T. 1995. Accounting of water use and wastewater generation in the seafood industry. Abstract #93C-2. Presented at the IFT Annual Meeting, Anaheim, CA. June 3-7. 29. Park, J.W. and Patil, S.K. 1995. Special waxy maize corn starch to develop high quality surimi-based crabmeat. Abstract # 1-143. Presented at the 1995 International Chemical Congress of Pacific Basin Societies, Honolulu, Hawaii, December 17-22. 30. Park, J.W., Yongsawatdigul, J., and Kolbe, E. 1995. Ohmic heating-induced chemical changes of Pacific whiting surimi. Abstract #1-315. Presented at the 1995 International Chemical Congress of Pacific Basin Societies, Honolulu, Hawaii, December 17-22. 31. Lin, T.M. and Park, J.W. 1996. Post-harvest conditions affect the quality and quantity of Pacific whiting surimi proteins. Presented at the Pacific Fishery Technologists Annual Meeting, San Diego, CA. Feb 18-21. 32. Lin, T. M. and Park, J.W. 1996. Effective washing with minimum water in surimi processing. Presented at the Pacific Fishery Technologists Annual Meeting, San Diego, CA. Feb 18-21. 33. Yoon, W. B., J.W. Park, and Kim, B.Y. 1996. Use of WLF equation for optimum storage condition of surimi-based seafood product. Abstract # 14A-11. Presented at the Annual Meeting of Institute of Food Technologists, New Orleans, LA. June 22-26. 34. Lin, T.M. and Park, J.W. 1996. Proteolytic degradation affects the loss of proteins during washing. Abstract # 62-1. Presented at the Annual Meeting of Institute of Food Technologists, New Orleans, LA. June 22-26. 35. Yongsawatdigul, J., Park, J.W., and Kolbe, E. 1996. Kinetics of myosin heavy chain degradation of Pacific whiting surimi. Abstract # 62-4. Presented at the Annual Meeting of Institute of Food Technologists, New Orleans, LA. June 22-26. 36. Park, J.W. 1996. Liquid plasma protein as gelling ingredient as enzyme inhibitor for Pacific whiting surimi. Abstract #62-5. Presented at the Annual Meeting of Institute of Food Technologists, New Orleans, LA. June 22-26. 37. Yongsawatdigul, J., Park, J.W., and Kolbe, E. 1996. Kinetics of texture changes in Pacific whiting surimi gel. Abstract # 80D-11. Presented at the Annual Meeting of Institute of Food Technologists, New Orleans, LA. June 22-26. 38. Park, J.W. 1996. Whey protein texturizer as functional gelling ingredient for surimi seafood. Abstract # 80D-13. Presented at the Annual Meeting of Institute of Food Technologists, New Orleans, LA. June 22-26. 39. Yoon, W. B. and J.W. Park. 1996. Thermorheological study of surimi gel system at sol-gel transition. Abstract # 86-1. Presented at the Annual Meeting of Institute of Food Technologists, New Orleans, LA. June 22-26. 40. Park, J.W. 1997. Role of calcium compounds in pollock and whiting surimi. Presented at the 48th Annual Meeting of Pacific Fisheries Technologists, Astoria, OR. April 20-23. 41. Park, J.W. and Wilson, R. 1997. Cryoprotectants: extended shelf-life of frozen surimi and their effect on gel color. Presented at the 48th Annual Meeting of Pacific Fisheries Technologists, Astoria, OR. April 20-23. 42. Flugstad, B., Kolbe, E., Park, J.W., Wu, H., and Zhao, Y. 1997. High frequency ohmic and dielectric heating methods for seafood products. Presented at the 48th Annual Meeting of Pacific Fisheries Technologists, Astoria, OR. April 20-23. 43. Wu, H, Flugstad, B., Kolbe, E., and Park, J.W. 1997. Ohmic heating of surimi paste and fish mince using variable frequency power. Presented at the 48th Annual Meeting of Pacific Fisheries Technologists, Astoria, OR. April 20-23. 44. Lin, T.M. and J.W. Park. 1997. Solubility of fish myosin as affected by conformational changes at various ionic strength and pH. Abstract #10-4. Presented at the Annual Meeting of Institute of Food Technologists, Orlando, FL. June 14-18. 45. Yongsawatdigul, J. and J.W. Park. 1997. Thermal denaturation and aggregation of fish myosin as affected by heating regime. Abstract #10-5. Presented at the Annual Meeting of Institute of Food Technologists, Orlando, FL. June 14-18. 46. Shie, J. and Park, J.W. 1997. Effects of pasteurization conditions on lethality and color/textural quality of surimi seafood. Abstract #69E-8. Presented at the Annual Meeting of Institute of Food Technologists, Orlando, FL. June 14-18. 47. Yongsawatdigul, J., Park, J.W., and Kolbe, E. 1997. Textural properties of Pacific whiting mince under ohmic heating. Abstract #69F-3. Presented at the Annual Meeting of Institute of Food Technologists, Orlando, FL. June 14-18. 48. Wu, H., Flugstad, B., Kolbe, E., and, Park, J.W. 1997. Ohmic heating of surimi paste at frequencies to 200 kHz. Abstract #35B-7. Presented at the Annual Meeting of Institute of Food Technologists, Orlando, FL. June 14-18. 49. Yang, H., Park, J.W., and Kim, B.Y. 1997. Studies of fracture and non-fracture tests on surimi starch gels. Abstract #69F-4. Presented at the Annual Meeting of Institute of Food Technologists, Orlando, FL. June 14-18. 50. Lee, N.G. and Park, J.W. 1997. Calcium compounds to improve gel functionality of pollock and whiting surimi. Abstract #69F-5. Presented at the Annual Meeting of Institute of Food Technologists, Orlando, FL. June 14-18. 51. Yoon, W. B., Kim, B.Y., and Park, J.W. 1997. Rheological characteristics of fibrinogen-thrombin mixture in surimi gels. Abstract #69F-6. Presented at the Annual Meeting of Institute of Food Technologists, Orlando, FL. June 14-18. 52. Shie, J.S. and Park, J.W. 1998. Thermal death times and pasteurization values of Enterococcus facium E-20 in surimi seafood. Presented at the Pacific Fishery Technologists Annual Meeting, Seattle, WA. Feb 23-25. 53. Tomlinson, K.R., Lin, T.M., and Park, J.W. 1998. Effects of salt concentration in fish chilling water on the quality of surimi. Presented at the Pacific Fishery Technologists Annual Meeting, Seattle, WA. Feb 23-25. 54. Shie, J.S. and Park, J.W. 1998. Thermal death times and pasteurization values of Enterococcus facium E-20 in surimi seafood. Abstract #32-8. Presented at the Annual Meeting of Institute of Food Technologists, Atlanta, GA. June 20-24. 55. Tomlinson, K.R., Lin, T.M., and Park, J.W. 1998. Effects of salt concentration in fish chilling water on the quality of surimi. Abstract #32-9. Presented at the Annual Meeting of Institute of Food Technologists, Atlanta, GA. June 20-24. 56. Cho, M.S. and Park, J.W. 1998. Effects of hydration time on gel functionality of major protein additives at various ionic strengths. Abstract #34D-2. Presented at the Annual Meeting of Institute of Food Technologists, Atlanta, GA. June 20-24. 57. Yongsawatdigul, J., Park, J.W., Virulhakul, P., and Viratchakul, S. 1999. Proteolytic degradation in tropical tilapia surimi. Abstract #35-3. Presented at the IFT annual meeting (Chicago, IL). July 23-27. 58. Klesk, K., Yongsawatdigul, J., Park, J.W., Viratchakul, S., and Virulhakul, P. 1999. Functional properties of tropical tilapia surimi as compared with Alaska pollock surimi and Pacific whiting surimi. Abstract #35-2. Presented at the IFT annual meeting (Chicago, IL). July 23-27. 59. Wendel, A., Park, J.W., Kristbergsson, K., and Kolbe, K. 1999. Evaluation of two meat recovery systems (water jet and mechanical deboning) from fish frames. Abstract #50D-25. Presented at the IFT annual meeting (Chicago, IL). July 23-27. 60. Lopetcharat, K. and Park, J.W. 1999. Biochemical and microbiological characteristics of Pacific whiting and surimi by product during fish sauce fermentation. Abstract #35-5. Presented at the IFT annual meeting (Chicago, IL). July 23-27. 61. Lopetcharat, K. and Park, J.W. 1999. Autolytic activity of enzymes in pacific whiting and surimi by-product (SBP) during fish sauce production. Abstract #50D-22. Presented at the IFT annual meeting (Chicago, IL). July 23-27. 62. Kim, I.S., Choi, Y.J., Im, Y.S., Park, J.W., and Choi, Y.J. 1999. Hydrolysis of salted anchovies and actomyosin by various proteases. Abstract #50D-21. Presented at the IFT annual meeting (Chicago, IL). July 24-27. 63. Choi, Y.J., Kim, I.S., Cho, Y.J., Seo, D.S., and Park, J.W. 1999. Characterization of hydrolytic fragments from anchovy sauce and actomyosin. Abstract #50D-19. Presented at the IFT annual meeting (Chicago, IL). July 23-27. 64. Choi, Y.J., Park, J.W., Seo, D.S., and Cho, Y.J. 1999. Characteristics of isolated proteins for a possible quality parameter of fish sauce. Abstract #50D-20. Presented at the IFT annual meeting (Chicago, IL). July 23-27. 65. Zhao, Y., Flugstad, B., Kolbe, E., Wells, J.H., and Park J.W. 1999. Capacitive (Radio frequency) dielectric heating in pasteurization of surimi seafoods and vegetable sprout seeds. Presented at COFE '99, Dallas, TX. November 4. 66. Hoffman. J. and Park, JW. 2000. Improved torsion test using molded surimi gels. Presented at the Pacific Fishery Technologists Annual Meeting, Ketchikan, AK. March 26-29. 67. Jaczynski, J and Park, J.W. 2000. Post-pasteurization color and texture models for surimi seafood. Abstract #51A-3. Presented at the IFT annual meeting (Dallas, TX). June 10-13. 71. Hunt, A., Park, J.W., and Linck, K. 2000. Optimum levels of phosphate to improve the frozen shelf life of Pacific whiting surimi. Abstract #51A-7. Presented at the IFT annual meeting (Dallas, TX). June 10-13. 72. Yoon, W.B., Gunasekaran, S., and Park, J.W. 2000. Comparison of critical behavior of two biopolymer gel systems using scaling analysis. Abstract #49-8. Presented at the IFT annual meeting (Dallas, TX). June 10-13. 73. Hoffman, J., Park, J.W., and Choi, Y.J. 2000. Effects of freeze-drying and flake freezing on the gelation properties of Pacific whiting surimi. Abstract #75-2. Presented at the IFT annual meeting (Dallas, TX). June 10-13. 74. Jaczynski, J., Park, J.W., and Daeschel, M.A. 2000. Pasteurization model for surimi seafood using Staphylococcu aureus as a target microorganism. Abstract #75-3. Presented at the IFT annual meeting (Dallas, TX). June 10-13. 75. Yoon, W. B., Park, J.W., and Gunasekaran, S.. 2000. Structure development rate during gelation of surimi using a non-isothermal kinetic model. Abstract #75-4. Presented at the IFT annual meeting (Dallas, TX). June 10-13. 76. Flugstad, B.A., Zhao, Y., E.R. Kolbe, Wells, J.H., and Park, J.W. 2000. Capacitive (radiofrequency) dielectric heating of foods and seeds: characterization of base dielectric properties. Abstract #86A-8. Presented at the IFT annual meeting (Dallas, TX). June 10-13. 77. Jaczynski, J. and Park, J.W. 2000. Development of heat transfer and color/texture models for surimi seafood during thermal pasteurization. Symposium #139. PacifiChem 2000. December 13-18. Honilulu, HI. 78. Park, J. 2001. New development in surimi and surimi seafood. Symposium – Surimi and Fish Mince Technology. The 11th World Congress of Food Science and Technology (April 26-30, 2001). Seoul, Korea. 79. Park, J.W., Hunt, A., and Jaczynski, J. 2001. New packaging system for frozen surimi. Presented at Pacific Fisheries Technologists Annual Meeting. La Paz, Mexico. 80. Jaczynski, J., Park, J.W., and Zinn, C. 2001. E-Beam as a novel technology for surimi seafood pasteurization. Presented at Pacific Fisheries Technologists Annual Meeting. La Paz, Mexico. 81. Yoon, W.B., Gunasekaran, and Park, J.W. 2001. Investigating xanthan-carob synergistic interactions by estimating elastically active network chains. Abstarct #12-6. Presented at the IFT Annual Meeting (New Orleans, LA). June 23-27. 82. Jaczynski, J., Park, J.W., and Zinn, C. 2001. Inactivation kinetics of Staphylococcus aureus in surimi seafood under electron beam. Abstract #42-7. Presented at the IFT Annual Meeting (New Orleans, LA). June 23-27. 83. Pongviratchai, P., and Park, J.W. 2001. Starches and protein additives cooked under ohmic and conventional heating methods. Abstract #42-9. Presented at the IFT Annual Meeting (New Orleans, LA). June 23-27. 84. Yoon, W.B., Gunasekaran, and Park, J.W. 2001. Simulation of dynamic rheological behavior of fish muscle protein paste. Abstract #44B-9. Presented at the IFT Annual Meeting (New Orleans, LA). June 23-27. 85. Yoon, W.B., Gunasekaran, and Park, J.W. 2001. Effect of temperature history on rheological behavior of biopolymer gels. Abstract #44B-10. Presented at the IFT Annual Meeting (New Orleans, LA). June 23-27. 86. Kim, Y.S., Park, J.W., and Kim, B.J., and Choi, Y.J. 2001. Use of pH adjustment and centrifugation for surimi processing from Pacific whiting. Abstract # 73F-7. Presented at the IFT Annual Meeting (New Orleans, LA). June 23-27. 87. Jaczynski, J., Park, J.W., and Zinn, C. 2001. Physicochemical characteristics of surimi seafood under electron beam. Abstract #73F-9. Presented at the IFT Annual Meeting (New Orleans, LA). June 23-27. 88. Esturk, O. and Park, J.W. 2001. Rheological characterization of Pacific whiting surimi based on fracture and non-fracture gel analysis as affected by pH, setting and salt content. Abstract #73F-10. Presented at the IFT Annual Meeting (New Orleans, LA). June 23-27. 89. Tungkawachara, S., Park, J.W., Y.J. Choi, and J.D. Park. 2001. Biochemical properties of fish sauce made from Pacific whiting and its mixture with surimi by-product. Abstract # 73F-14. Presented at the IFT Annual Meeting (New Orleans, LA). June 23-27. 90. Hjálmarsson, G.H., Kristbergsson, K., Park, J.W., and Arason, S. 2001. Fish sauce from capelin (Mallotus villotus) as affected by harvest season. Abstract #73F-15. Presented at the IFT Annual Meeting (New Orleans, LA). June 23-27. 91. Park, J.W. and Regenstein, J.M. 2001. Symposium, Food byproducts and waste utilization. Session #82. Chaired at at the IFT Annual Meeting (New Orleans, LA). June 23-27. 92. Yongsawatdigul, J. and Park, J.W. 2001. Gelation characteristics of alkaline and acid solubilization of fish muscle proteins. Abstract #100-1. Presented at the IFT Annual Meeting (New Orleans, LA). June 23-27. 93. 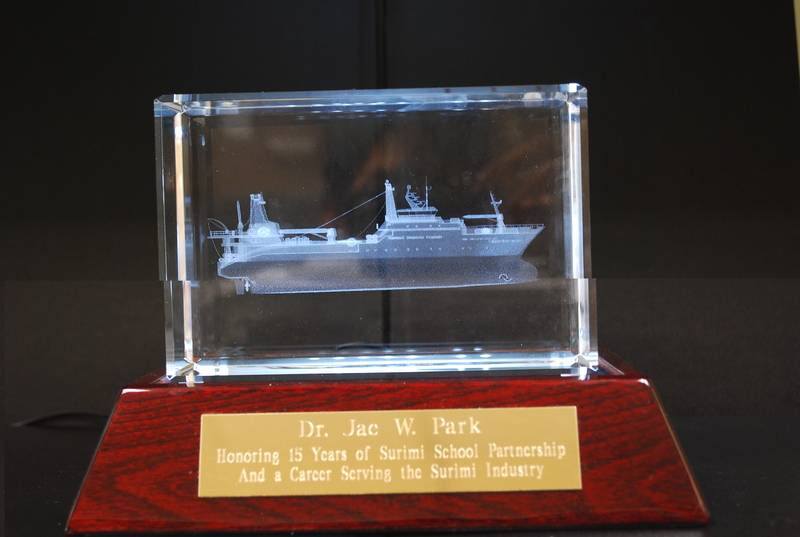 Yoon, W.B., Gunasekaran, and Park, J.W. 2001. Estimating steady shear viscosity of fish muscle protein paste at different concentrations. Abstract #100-3. Presented at the IFT Annual Meeting (New Orleans, LA). June 23-27. 94. Hunt, A., Park, J.W., and Jaundoo, C. 2001. Cryoprotection of Pacific whiting surimi using a non-sweet glucose polymer. Abstract #100-4. Presented at the IFT Annual Meeting (New Orleans, LA). June 23-27. 95. Yongsawatdigul, J. and Park, J.W. 2001. Biochemical changes of threadfin bream during ice storage and their effects on thermal denaturation patterns. Abstract# 100-7. Presented at the IFT Annual Meeting (New Orleans, LA). June 23-27. 96. Park, J.W. 2001. Surimi gel preparation and analysis for better quality control. Presented at Int’l Symposium, More Efficient Utilization of Fish and Fisheries Products. Kyoto University, Kyoto, Japan. October 8-10. 97. Yongsawatdigul, J., Kim, Y.S., and Park, J.W. 2001. Biochemical and gelation properties of acid-and alkaline-aided solubilization of fish muscle proteins. Presented at Int’l Symposium, More Efficient Utilization of Fish and Fisheries Products. Kyoto University, Kyoto, Japan. October 8-10. 98. Yongsawatdigul, J. and Park, J.W. 2001. Gelation of threadfin bream surimi as affected by thermal denaturation, transglutaminase and proteinase(s) activities. Presented at Int’l Symposium, More Efficient Utilization of Fish and Fisheries Products. Kyoto University, Kyoto, Japan. October 8-10. 99. Choi, Y.J. and Park, J.W. 2001. Rheological properties of surimi from acid-aided processing. Presented at Int’l Symposium, More Efficient Utilization of Fish and Fisheries Products. Kyoto University, Kyoto, Japan. October 8-10. 100. Thawornchinsombut, S. and Park, J.W. 2002. Protein solubility of Pacific whiting at various pH and ionic strengths. Presented at Pacific Fisheries Technologists Annual Meeting. Reno, NV. 101. Jaczynski, J. and Park, J.W. 2002. Gelation properties of fish proteins and penetration depth as affected by e-beam. Presented at Pacific Fisheries Technologists Annual Meeting. Reno, NV. 102. Hunt, A., Park, J.W., and Jaundoo, C. 2002. Glucose polymer as an effective cryoprotectant. Presented at Pacific Fisheries Technologists Annual Meeting. Reno, NV. 103. Choi, M.R., Park, J.W., Feng, Y., and Hultin, H.O. 2002. Gelation properties of fish proteins at reduced ionic strength. Presented at Pacific Fisheries Technologists Annual Meeting. Reno, NV. 104. Jaczynski, J., Park, J.W. and Zinn, C.A. 2002. Non-thermal electron beam affects gelation properties of fish proteins. Abstract # 44-2. Presented at the IFT Annual Meeting (Anaheim, CA). June 16-19. 105. Kim, Y.S., Park, J.W., and Choi, Y.J. 2002. Physicochemical properties of fish proteins treated at various pH conditions. Abstract # 56-4. Presented at the IFT Annual Meeting (Anaheim, CA). June 16-19. 106. Tungkawachara, S. and Park, J.W. 2002. Interactive effect of salt concentration and pH pn enzyme activities in Pacific whiting fish sauce. Abstract # 56-8. Presented at the IFT Annual Meeting (Anaheim, CA). June 16-19. 107. Jaczynski, J., Park, J.W., and Zinn, C.A. 2002. Electron beam petration in seafood. Abstract # 76E-1. Presented at the IFT Annual Meeting (Anaheim, CA). June 16-19. 108. Choi, M.R., Park, J.W., Feng, Y., and Hultin, H.O. 2002. Reduction of ionic strength in fish proteins and its effect on gel characteristics. Abstract # 76E-12. Presented at the IFT Annual Meeting (Anaheim, CA). June 16-19. 109. Thawornchinsombut, S. and Park, J.W. 2002. Protein solubility of Pacific whiting surimi at various pH and ionic strengths and its effect on gelation characteristics. Abstract # 76E-33. Presented at the IFT Annual Meeting (Anaheim, CA). June 16-19. 110. Pongviratchai, P. and Park, J.W. 2002. Effect of starch on gelation properties of fish protein under ohmic heating. Abstract # 99-1. Presented at the IFT Annual Meeting (Anaheim, CA). June 16-19. 111. Esturk, O. and Park, J.W. 2002. Rheological and biochemical behaviors of fish proteins from various species. Abstract # 99-5. Presented at the IFT Annual Meeting (Anaheim, CA). June 16-19. 112. Hunt, A., Park, J.W., and Zoerb, H. 2002. Trehalose as Functional Cryoprotectant for Fish Proteins. Abstract # 99-6. Presented at the IFT Annual Meeting (Anaheim, CA). June 16-19. 113. Tungkawachara, S. and Park, J.W. 2002. Pacific whiting fish sauce: processing and marketing potential. Presented at the 2nd International Seafood Byproduct Conference (Anchorage, AK), Nov 10-13. 114. Tungkawachara, S., Choi, Y.J., and Park, J.W. 2003. ACE inhibition of Pacific whiting fish sauce. Presented at the 54th Pacific Fisheries Technologists (Astoria, OR). Feb 23-26. 115. Esturk, O. and Park, J.W. 2003. Degradation and aggregation properties of fish proteins from various species. Presented at the 54th Pacific Fisheries Technologists (Astoria, OR). Feb 23-26. 116. Thawornchinsombut, S. and Park, J.W. 2003. Combined effect of pH and ionic strength on gelation properties of Pacific whiting fish proteins. Presented at the 54th Pacific Fisheries Technologists (Astoria, OR). Feb 23-26. 117. Kim, Y.S. and Park, J.W. 2003. Sarcoplasmic proteins at various pH and their interaction with myofibrillar proteins. Presented at the 54th Pacific Fisheries Technologists (Astoria, OR). Feb 23-26. 118. Kim, Y.S. and Park, J.W. 2003. Characteristics of sarcoplasmic proteins at various pH and their interaction with myofibrillar proteins. Abstract #40-4. Presented at the IFT Annual Meeting (Chicago, IL). July 12-16. 119. Pongviratchai, P. and Park, J.W. 2003. Control of the stickiness of refrigerated surimi seafood by pre-gelled starch. Abstract #40-5. Presented at the IFT Annual Meeting (Chicago, IL). July 12-16. 120. Kim, J.S. and Park, J.W. 2003. Gelatin from solid by-products of Pacific whiting surimi processing. Abstract #76A-10. Presented at the IFT Annual Meeting (Chicago, IL). July 12-16. 121. Tungkawachara, S. and Park, J.W. 2003. Regression models for quality control in the Pacific whiting fish sauce processing. Abstract #76A-13. Presented at the IFT Annual Meeting (Chicago, IL). July 12-16. 122. Kim, Y.S. and Park, J.W. 2003. Gelation of special fish muscle proteins without salt. Abstract #76A-15. Presented at the IFT Annual Meeting (Chicago, IL). July 12-16. 123. Pongviratchai, P. and Park, J.W. 2003. Effects of potato starch on electrical conductivity of fish proteins under ohmic heating. Abstract #76A-16. Presented at the IFT Annual Meeting (Chicago, IL). July 12-16. 124. Tungkawachara, S., Park, J.W., and Choi, Y.J. 2003. ACE inhibition of Pacific whiting fish sauce at various processing conditions. Abstract #102-2. Presented at the IFT Annual Meeting (Chicago, IL). July 12-16. 125. Esturk, O. and Park, J.W. 2003. Thermal stability of fish proteins from various species. Abstract #102-2. Presented at the IFT Annual Meeting (Chicago, IL). July 12-16. 126. Hunt, A. and Park, J.W. 2003. Chitosan as protein stabilizer for fish proteins during frozen storage. Abstract #102-8. Presented at the IFT Annual Meeting (Chicago, IL). July 12-16. 127. Thawornchinsombut, S., Park, J.W., Meng, G., and Li-Chan, E. 2004. Raman spectroscopy determines structural changes of fish proteins recovered at alkaline pH. Presented at the PFT Annual Meeting (Seattle, WA). Feb 29 – Mar 3. 128. Hunt, A., Kim, J.S., Park, J.W., and Schnee, R. 2004. Frozen storage of fish proteins as affected by various phosphate blends. Presented at the PFT Annual Meeting (Seattle, WA). Feb 29 – Mar 3. 129. Park, J.W., Choi, Y, J., Yongsawatdigul, J., Thawornchinsombut, S. 2004. Biochemical and functional properties of isolated fish proteins from Pacific whiting and rockfish using pH shifts. Paper # 3-2. Presented at the IFT Annual Meeting (Las Vegas, NV), July 12-16. 130. Le Formal, G. and Park, J.W. 2004. Electron beam treatment extends the shelf life of fresh salmon. Paper # 49B-27. Presented at the IFT Annual Meeting (Las Vegas, NV), July 12-16. 131. Thawornchinsombut and Park, J.W. 2004. Paper # 17E-26. Frozen stability of fish proteins isolated by pH shift. Presented at the IFT Annual Meeting (Las Vegas, NV), July 12-16. 132. McGill, J., Yongsawatdigul, J., Park, J.W., and Hunt, A. 2004. Paper #63-1. Quantitative analysis of myofibrillar proteins in commercial surimi seafood. Presented at the IFT Annual Meeting (Las Vegas, NV), July 12-16. Paper #63-4. Presented at the IFT Annual Meeting (Las Vegas, NV), July 12-16. 134. Hunt, A, Kim, J.S., Park, J.W., and Schnee, R. 2004. Effect of various blends of phosphate on fish proteins during frozen storage. Paper #63-11. Presented at the IFT Annual Meeting (Las Vegas, NV), July 12-16. 135. Kim, J.S. and Park, J.W. 2004. Biochemical and functional properties of various phosphate blends. Paper #83A-4. Presented at the IFT Annual Meeting (Las Vegas, NV), July 12-16. 136. Tungkawachara, S., Park, J.W., and Choi, Y.J. 2004. Characterization of partially purified enzymes from Pacific whiting intestines. Paper #83A-6. Presented at the IFT Annual Meeting (Las Vegas, NV), July 12-16. 137. Kim, J.S. and Park, J.W. 2004. Partially purified collagen from refiner discharge of Pacific whiting surimi processing. Paper# 83A-10. Presented at the IFT Annual Meeting (Las Vegas, NV), July 12-16. 138. Thawornchinsombut, S. and Park, J.W. 2004. Gelation characteristics of fish proteins isolated by pH and ionic strength shift. Paper #83A-22. Presented at the IFT Annual Meeting (Las Vegas, NV), July 12-16. 139. Park, J.W. and Kim, B.Y. 2005. Development of capillary extrusion viscometer for the viscosity measurement of fish protein paste. Paper #36D. Presented at the IFT Annual Meeting (New Orleans, LA), July 16-20. 140. Kok, N.T.N, Park, J., Lin, T.M., and Park, J.W. 2005. Multidisciplinary approaches for early determination of gelation properties of fish proteins. Paper #50-3. Presented at the IFT Annual Meeting (New Orleans, LA), July 16-20. 141. Hunt, A.L., Park, J.W., and Handa, A. 2005. Effects of special dried egg white on fish protein gels compared to other egg whites. Paper #89B-5. Presented at the IFT Annual Meeting (New Orleans, LA), July 16-20. 142. Kim, J.S. and Park, J.W. 2005. Functional characterization of gelatin sauce developed from Pacific whiting surimi by-products. Paper #89B-17. Presented at the IFT Annual Meeting (New Orleans, LA), July 16-20. 143. Choi, Y.J. and Park, J.W. 2005. Improvement of whiteness of recovered proteins obtained by alkaline processing. Paper #89B-18. Presented at the IFT Annual Meeting (New Orleans, LA), July 16-20. 144. Hunt, A.L. and Park, J.W. 2005. Development of temperature tolerant fish protein gels using special starches. Paper #89B-23. Presented at the IFT Annual Meeting (New Orleans, LA), July 16-20. 145. Park, J.W. and Thawornchinsombut, S. 2005. Optimization of gel preparation from near zero ionic strength fish proteins using response surface methodology. Paper #89B-25. Presented at the IFT Annual Meeting (New Orleans, LA), July 16-20. 146. Park, J., Choi, Y.J., and Park, J.W. 2005. Effects of myoglobin on the gelation properties of Alaska pollock surimi. Paper #89B-27. Presented at the IFT Annual Meeting (New Orleans, LA), July 16-20. 147. Kim, J.S. and Park, J.W. 2005. Isolation and characterization of antioxidative peptides from fish gelatin hydrolysates. Oral presentation. PacifiChem 2005, Honolulu, HI. Dec 15. 148. Kim, J.S. and Park, J.W. 2005. Isolation and characterization of antioxidative peptides from fish gelatin hydrolysates. Poster presentation. PacifiChem 2005, Honolulu, HI. Dec 16. 149. Park, J.W. 2006. Color quality of surimi seafood. The 231st American Chemistry Society National Meeting. Atlanta, GA. March 26-30. 150. Kang, E.J. and Park, J.W. 2006. Characteristis of sarcoplasmic proteins from sardines retained through pH-shifted method. Paper #020A-04. Presented at the IFT Annual Meeting (Orlando, FL), July 23-26. 151. Kok, T.N. and Park, J.W. 2006. Extending the shelf life of set fish ball. Paper #020A-10. Presented at the IFT Annual Meeting (Orlando, FL), July 23-26. 152. Hunt, A., Handa, A., and Park, J.W. 2006. Interactions between special egg white and fish myofibrillar proteins. Paper #020A-14. Presented at the IFT Annual Meeting (Orlando, FL), July 23-26. 153. Kim, J.S., Heu. M., Park, C., and Park, J.W. 2006. Purification and characterization of angiotensin-converting enzymes (ACE) inhibitory peptides from a surimi processing byproduct. Paper #020A-26. Presented at the IFT Annual Meeting (Orlando, FL), July 23-26. 154. Kok, T.N. and Park, J.W. 2006. Elucidating factors affecting floatation of fish ball. Paper #020A-26. Presented at the IFT Annual Meeting (Orlando, FL), July 23-26. 155. Park, J.D., and Park, J.W. 2006. Effects of myoglobin on the gelation properties of Pacific whiting surimi. Paper #095-09. Presented at the IFT Annual Meeting (Orlando, FL), July 23-26. 156. Kim, J.S., Kang, K.T., and Park, J.W. 2006. Characterization of pepsin-solubilized collagen from refiner discharge of Pacific whiting. Presented at the Annual Meeting of Korean Society of Food Science and Nutrition (Gyeongju, S. Korea), Oct 18-20. 157. Park, JW, Reed, Z, Kang, EJ, Holt, C, and Graves, D. 2007. Improved ohmic cooker for surimi gel preparation. Paper #S01. Presented at the PFT Annual Meeting, Hermosillo, Mexico, Feb 18-21. 158. Park, JD, Park, JW. 2007. Conformational changes of sardine protein isolate during frozen storage. Paper #003-16. Presented at the IFT Annual Meeting (Chicago, IL). July 29-August 1. 159. Kang, EJ, Park, JW. Hunt, AL. 2007. Effects of salinity on physicochemical properties of surimi after repeated freeze/thaw cycles. Paper #052-20. Presented at the IFT Annual Meeting (Chicago, IL). July 29-August 1. 160. Park, JD, Park, JW. 2007. Biochemical and conformational changes of myosin from Pacific sardine at various pH. Paper #117-01. Presented at the IFT Annual Meeting (Chicago, IL). July 29-August 1. 161. Reed, ZH, Park, JW. 2007. Qualification and Quantification of fish protein sources in commercially prepared crabstick products. Paper #117-05. Presented at the IFT Annual Meeting (Chicago, IL). July 29-August 1. 162. Hunt, AL, Park, JW, Getty, K. 2007. Development of temperature tolerant fish protein gels using a mixture of special starches with corn and potato starch. Paper #117-06. Presented at the IFT Annual Meeting (Chicago, IL). July 29-August 1. 163. Okada, T. Park, JD, Park, JW, Morrissey, MT. 2007. Recovery of Pacific sardine protein and determination of their functional properties. Paper #003-15. Presented at the IFT Annual Meeting (Chicago, IL). July 29-August 1. 164. Hunt A, Park JW. 2008. Interaction of Fish protein and Pure Carrageenan as Affected by Various Salts. Presented at the PFT Annual Meeting, San Francisco, CA. Feb 3-6. 165. Park JD, Park JW. 2008. Phospholipids from Pacific Sardine. Presented at the PFT Annual Meeting, San Francisco, CA. Feb 3-6. 166. Reed Z. 2008. Qualification and Quantification of Protein Additives in Prepared Crabstick using ELISA. Presented at the PFT Annual Meeting, San Francisco, CA. Feb 3-6. 167. Park JW. 2008. Phosphate-free Surimi: Feasible Challenge or Problematic. Presented at the PFT Annual Meeting, San Francisco, CA. Feb 3-6. 168. Hunt AL, Park JW. 2008. Optimization of kappa/iota carrageenan blend in Alaska pollock surimi. Paper # 085-01. Presented at the IFT Annual Meeting (New Orleans, LA). June 28-July 1. 169. Reed ZH, Park JW. 2008. Use of ELISA in Determining the Egg White and Whey Proteins in Prepared Crabsticks Paper # 085-05. Presented at the IFT Annual Meeting (New Orleans, LA). June 28-July 1. 170. Tadpitchayangkoon P, Yongsawatdigul J, Park JW. 2008. Physiochemical and rheological properties of sarcoplasmic protiens treated at various pHs. Paper #085-03. Presented at the IFT Annual Meeting (New Orleans, LA). June 28-July 1. 171. Yongsawatdigul J, Park JW. 2008. Rheological and gel-enhancing properties of fractionated threadfin bream sarcoplasmic proteins. Paper # 085-02. Presented at the IFT Annual Meeting (New Orleans, LA). June 28-July 1. 172. Youn KS, Park JW. 2008. Prediction of storage stability of surimi gel as affected by moisture and salt content. Paper #091-21. Presented at the IFT Annual Meeting (New Orleans, LA). June 28-July 1. 173. Park JD, Park JW. 2008. Extraction of phospholipids from Pacific sardine and their biochemical properties. Paper # 091-23. Presented at the IFT Annual Meeting (New Orleans, LA). June 28-July 1. 174. Park JD, Park JW. 2008. Effects of phospholipids on texture and color properties of surimi Paper # 091-24. Presented at the IFT Annual Meeting (New Orleans, LA). June 28-July 1. 175. Park JD, Park JW. 2008. Extraction of phospholipids from Pacific sardine and their biochemical properties. Paper # 091-23. Presented at the IFT Annual Meeting (New Orleans, LA). June 28-July 1. 176. Park JD, Park JW. 2008. Effects of phospholipids on texture and color properties of surimi Paper # 091-24. Presented at the IFT Annual Meeting (New Orleans, LA). June 28-July 1. 177. Reed ZH, Kang EJ, Holt C, Graves D, Park JW. 2008. Advanced ohmic cooker for accurate gel analysis. Paper #091-37. Presented at the IFT Annual Meeting (New Orleans, LA). June 28-July 1. 178. Kim JS, Hur SI, Park JW. 2008. Processing optimization of gelatin from surimi by-product. Paper #091-48. Presented at the IFT Annual Meeting (New Orleans, LA). June 28-July 1. 179. Park JW. 2008. Research update –Functional fish protein isolate. Paper #4a-11387.The 5th World Fisheries Congress, Yokohama, Japan. October 20-24. 180. Hunt A, Park JW. 2009. Effect of different salinity content on gelation properties of surimi fish proteins during frozen storage. Poster #23. Presented at the PFT Annual Meeting (Portland, OR). Feb 22-25. 181. Reed ZH, Park JW. 2009. Estimating the quantity of fish species used in crabstick by indirect ELISA. Presented at Seafood Chemistry Session (1:00-2:45, Tue, Feb 24), PFT Annual Meeting (Portland, OR). Feb 22-25. 182. Poowakanjana S, Park JW. 2009. Physical and chemical treatments to stabilize carmine colorant used in crabstick. Poster #09. Presented at the PFT Annual Meeting (Portland, OR). Feb 22-25. 183. Hunt A, Park JW. 2009. Effect of different freezing rates and sodium bicarbonate on the gelation properties of Alaska Pollock fish proteins during frozen storage. Paper #119-01. Presented at the IFT Annual Meeting (Anaheim, CA). June 6-9. 184. Tadpitchayangkoon P, Park JW, Yongsawatdigul J. 2009. Effect of pH shifting process on dynamic rheological properties of sarcoplasmic proteins. Paper #119-03. Presented at the IFT Annual Meeting (Anaheim, CA). June 6-9. 185. Tadpitchayangkoon P, Park JW, Yongsawatdigul J. 2009. Fourier-transform Raman spectroscopic study on strunctural changes of sarcoplsmic proteins treated at various pHs. Paper #119-19. Presented at the IFT Annual Meeting (Anaheim, CA). June 6-9. 186. Poowakanjana S, Park JW. 2009. Stabilization of carmine colorant in crabstick. Paper #068-03 (Student oral professional development). Presented at the IFT Annual Meeting (Anaheim, CA). June 6-9. 187. Poowakanjana S, Park JW. 2009. Stabilization of carmine colorant in crabstick. Paper #119-05 (poster). Presented at the IFT Annual Meeting (Anaheim, CA). June 6-9. 188. Poowakanjana S, Park, JD, Park JW. 2009. Gelation properties of pelagic fish surimi and protein isolate as affected by ohmic cooking. Paper #119-17. Presented at the IFT Annual Meeting (Anaheim, CA). June 6-9. 189. Park, JD, Poowakanjana S, Park JW. 2009. Effect of storage pH on Pacific sardine protein isolate during freeze-thaw cycles. Paper #119-13. Presented at the IFT Annual Meeting (Anaheim, CA). June 6-9. 190. Reed ZH, Park JW. 2009. Detection of species substitution of Alaska Pollock using indirect ELISA. Paper #118-19. Presented at the IFT Annual Meeting (Anaheim, CA). June 6-9. 191. Reed ZH, Park JW. 2009. ELISA for detecting and quantifying Alaska Pollock used in crabsticks. Paper #119-07. Presented at the IFT Annual Meeting (Anaheim, CA). June 6-9. 192. Reed ZH, Park JW. 2009. Effect of temperature, hold time, and frequency on Pacific whiting surimi gels using ohmic cooking. Paper #119-31. Presented at the IFT Annual Meeting (Anaheim, CA). June 6-9. 193. Park, JW. 2010. Technology transfer: from ohmic research to fast cooking gel device. Presented at the 61st Annual Pacific Fisheries Technologists Conference. Seattle, WA. Feb 21-24. 194. Reed ZH, Park JW. 2010. Immunological investigation of raw Alaska pollock fillet using a direct sandwich ELISA for the detection of myosin light chain 1. Presented at the 61st Annual Pacific Fisheries Technologists Conference. Seattle, WA. Feb 21-24. 195. Poowakanjana, S, Park JW. 2010. Effect of communition conditions on gelation properties of Pacific whiting and threadfin bream. Presented at the 61st Annual Pacific Fisheries Technologists Conference. Seattle, WA. Feb 21-24. 196. Hunt, AL, Park JW. 2010. Evaluation of different soy proteins on gelation properties of Pacific whiting fish protein. Presented at the 61st Annual Pacific Fisheries Technologists Conference. Seattle, WA. Feb 21-24. 197. Hunt AL, Poowakanjana S, Park JW. 2010. Testing fat blockers and lipid contents of fried shrimp. The 2nd International Conference of Seafood Technology. Anchorage, AK. May 10-13. 198. Hunt AL, Park JW. 2010. Screening of Different Soy Proteins on Gelation Properties of for use in Surimi Seafood Formulations. Paper # 181-13. Presented at the IFT Annual Meeting (Chicago, IL). July 19-22. 199. Hunt AL, Park JW. 2010. Soak treatment of dover sole fillets with phosphate and non-phosphate brines Paper # 225-09. Presented at the IFT Annual Meeting (Chicago, IL). July 19-22. 200. Poowakanjana S, Park JW. 2010. Gelation properties of threadfin bream surimi based on comminution conditions Paper # 181-03. Presented at the IFT Annual Meeting (Chicago, IL). July 19-22. 201. Poowakanjana S, Park JW. 2010. Biochemical and gelation properties of Pacific mackerel protein isolate as affected by freezing methods and storage time. Paper # 181-04. Presented at the IFT Annual Meeting (Chicago, IL). July 19-22. 202. Reed ZH, Park JW. 2010. Characterization of myosin, heavy meromyosin and light meromyosin from Pacific whiting. Paper # 181-14. Presented at the IFT Annual Meeting (Chicago, IL). July 19-22. 203. Hunt AL, Park JW, Jaundoo C. 2011. Evaluation of pea proteins on gelation properties and autolytic activity when added to fish proteins. Presented at the 62nd Annual Pacific Fisheries Technologists Conference. Vancouver, BC. Feb 13-16. 204. Poowakanjana S, Park JW. 2011. Physiochemical and gelation properties of Alaska pollock surimi as affected by comminution conditions. Presented at the 62nd Annual Pacific Fisheries Technologists Conference. Vancouver, BC. Feb 13-16. 205. Reed ZH, Park JW. 2011. Physiochemical characterization of tilapia myosin as affected by constantly increasing heat. Presented at the 62nd Annual Pacific Fisheries Technologists Conference. Vancouver, BC. Feb 13-16. 206. Park JW. 2011. Low-fat fried seafood products using fat blockers. Presentation Number: 022-04. Presented at the IFT Annual Meeting (New Orleans, LA). June 11-14. 207. Hunt A, Jaundoo C, Park JW. 2011. Gelling properties of pea proteins in crabstick prepared using Alaska pollock surimi. Presentation Number: 045-07. Presented at the IFT Annual Meeting (New Orleans, LA). June 11-14. 208. Poowakanjana S, Park JW. 2011. Effect of salting on threadfin bream surimi during various chopping conditions. Presentation Number: COMP01-07. Presented at the IFT Annual Meeting (New Orleans, LA). June 11-14. 209. Hur S, Kim DS, Cho SM, Park JW. 2011. Rice flour- A functional ingredient for premium crabstick. Presentation Number: 045-06. Presented at the IFT Annual Meeting (New Orleans, LA). June 11-14. 210. Poowakanjana S, Park JW. 2011. Optimum comminution conditions of Alaska pollock surimi and their relation to the exposure of hydrophobic amino acids. Presentation Number: 231-13. . Presented at the IFT Annual Meeting (New Orleans, LA). June 11-14. 211. Poowakanjana S, Park JW. 2011. Effect of salting on threadfin bream surimi during various chopping conditions. Presentation Number: 231-15. Presented at the IFT Annual Meeting (New Orleans, LA). June 11-14. 212. Reed Z, Park JW. 2011. Physiochemical characterization of heavy meromyosin and light meromyosin isolated from pre-rigor tilapia. Presentation Number: 231-08. Presented at the IFT Annual Meeting (New Orleans, LA). June 11-14. 213. Park JW. 2011. Upgrade of tropical surimi using fast cooking. ASEAN Food Conference 2011, Bangkok, Thailand. June 16-17. 214. Park JW, Hunt AL, Olvera. 2011 The role of fish proteins as fat blockers in fried seafood. NFI Convention, Colorado Springs, Co. Sept 12-14. 215. Park JW. 2011. Maximize the value of fish proteins based on their thermal stability. International Symposium, Institute of Fisheries Sciences, Pukyung National University, Busan, Korea. Oct 13. 216. Park JW, Hunt AL, Olvera B. 2011. Healthy fried seafood using fish protein as a fat blocker. Presented at Korean Fisheries Society Conference, Busan, Korea. Nov 18. 217. Hunt AL Kim WS, Park JW. 2011. Non-phosphate ingredient as phosphate replacement in brine treatment of dover sole fillets. Presented at Korean Fisheries Society Conference, Busan, Korea. Nov 18. 218. Hunt AL Park JW, Sato H, Kodera K. 2012. Effect of addition time of mTGase on gel properties of various fish proteins. Presented at Pacific Fisheries Technologists (Anchorage, AK). Feb 12-15. 219. Hunt AL, Kumazawa Y, Sato H., Park JW. 2012. Effect of Added Transglutaminase on surimi from various species before freezing. Presentation #145-03. Presented at the IFT Annual Meeting (Las Vegas, NV).June 25-28. 220. Poowakanjana S, Park JW. 2012. Understanding rheological and spectroscopic properties of surimi as affected by fish protein concentration and chopping temperature. Presentation #270-03. Presented at the IFT Annual Meeting (Las Vegas, NV). June 25-28. 221. Poowakanjana S, Park JW. 2012. Elastic modulus of Alaska pollock surimi paste as affected by various heating rates, frequencies, and moisture contents. Presentation #270-04. Presented at the IFT Annual Meeting (Las Vegas, NV). June 25-28. 222. Kokkaew H, Thawornchinsombut S, Park JW. 2012. Optimal removal of chemical hazards in proteins isolated from nile tilapia byproducts using response surface methodology. Presentation #276-04. Presented at the IFT Annual Meeting (Las Vegas, NV). June 25-28. 223. Kaewjumpol G, Kokkaew H, Thawornchinsombut S, Park JW. 2012. Phosphate compound substitution to stabilize frozen nile tilapia. Presentation #276-06. Presented at the IFT Annual Meeting (Las Vegas, NV). June 25-28. 224. Kokkaew H, Thawornchinsombut S, Park JW. 2012. Removal of chemical hazards in proteins isolated from yellowfin tuna byproduct using response surface methodology. Presentation #270-06. Presented at the IFT Annual Meeting (Las Vegas, NV). June 25-28. 225. Kokkaew H, Thawornchinsombut S, Park JW. 2012. Bioactive properties of tuna hydrolysates prepared using alkaline extraction and proteases. Presentation #270-07. Presented at the IFT Annual Meeting (Las Vegas, NV). June 25-28. 226. Kokkaew H, Thawornchinsombut S, Park JW. 2012. Effect of simulated gastrointestinal digestion on the bioactive properties of peptides derived from tuna byproducts. Presentation #270-08. Presented at the IFT Annual Meeting (Las Vegas, NV). June 25-28. 227. Hunt A, Park JW, Kumazawa Y, Kodera T. 2013. Effect of addition time of MTGase on various species during 54 weeks of frozen storage. Presented at the PFT annual meeting (Nayarit, Mexico). Feb 10-13. 228. Poowakanjana S, Park JW. 2013. Optimum Comminuting Procedures for Quality Surimi Seafood. Presentation #065-03. Presented at the IFT Annual Meeting (Chicago, IL). July 14-16. 229. Poowakanjana S, Park JW. 2013. Unfolding Behavior of Alaska Pollock Surimi During Various Chopping Conditions. Presentation #065-04. Presented at the IFT Annual Meeting (Chicago, IL). July 14-16. 230. Fowler M, Park JW. 2013. Protease Inhibitory Ability and Effect on Pacific Whiting Surimi Gel Quality of Salmon Blood Plasma. Presentation #065-08. Presented at the IFT Annual Meeting (Chicago, IL). July 14-16. 231. Yin T, Park JW. 2013. Effects of Fish Bone on Alaska Pollock Surimi Gels as Affected by Its Particle Size. Presentation #150-02. Presented at the IFT Annual Meeting (Chicago, IL). July 14-16. 232. Athailllah Z, Hunt A, Park JW. 2013. Film-Forming Ability of Fish Proteins. Presentation #150-03. Presented at the IFT Annual Meeting (Chicago, IL). July 14-16. 233. Yin T, Park JW. 2013. Effects of Nano-Scaled Fish Bone Emulsion on the Gelation Properties of Alaska Pollock Surimi. Presentation #210-02. Presented at the IFT Annual Meeting (Chicago, IL). July 14-16. 234. Hunt A, Park JW, Fine G, Ledet B. 2013. Surimi seafood crabstick sheet cooking using energy efficient CoolSteam cooker. Presentation #210-09. Presented at the IFT Annual Meeting (Chicago, IL). July 14-16. 235. Park JD, Park JW, Yoon WB. 2013. Semi-empirical relationship between properties of surimi pastes and failure shear stress of surimi gels at different moisture content. Presentation #210-06. Presented at the IFT Annual Meeting (Chicago, IL). July 14-16. 236. Fowler MR, Park JW. 2014 Salmon blood plasma to control textute softening of surimi and fresh salmon fillets. Presented at the North Pacific Research Board Conference, Jan 20, Anchorage, Alaska. 237. Liu Y, Park JW. 2014. Enhancing the gelation properties of Alaska pollock surimi by calcium chloride and heating conditions. Monterey, CA. Feb 23-26. 238. Park JW. 2014. Research update – nano fish bone for surimi gelation enhancement. The 65th PFT Conference, Monterey, CA. Feb 23-26. 239. Fowler M, Park JW. 2014. Characterization of protease inhibitor from Chinook salmon plasma fractionated by ultrafiltration. The 65th PFT Conference, Monterey, CA. Feb 23-26. 240. Hunt AH, Rolf D, Park JW. 2014. Effective reduction of salt content of surimi seafood using Smart Salt. The 65th PFT Conference, Monterey, CA. Feb 23-26. 241. Kobayashi Y, Hunt A, Park JW. 2014. Surimi as effective fat blockers in fried seafood. Presentation # Comp 01-02. Presented at the IFT Annual Meeting (New Orleans, LA). July 22-24. 242. Fowler M, Park JW. 2014. Proteolytic inhibition by salmon plasma fractionated using ultrafiltration in Pacific whiting surimi and salmon mince. Presentation # Comp 01-04. Presented at the IFT Annual Meeting (New Orleans, LA). July 22-24. 243. Lee M, Park JW. 2014. Predicting thermal patterns of surimi gels affected by sample dimensions using computational fluid dynamics (CFD). Presentation # 023-02. Presented at the IFT Annual Meeting (New Orleans, LA). July 22-24. 244. Yoon W, Moon J, Park JW. 2014. Salting kinetics model for the preparation of sea cucumber. Presentation # 023-03. Presented at the IFT Annual Meeting (New Orleans, LA). July 22-24. 245. Fowler M, Park JW. 2014. Proteolytic inhibition by salmon plasma fractionated using ultrafiltration in Pacific whiting surimi and salmon mince. Presentation # 047-01. Presented at the IFT Annual Meeting (New Orleans, LA). July 22-24. 246. Kobayashi Y, Hunt A, Park JW. 2014. Surimi as effective fat blockers in fried seafood. Presentation # 108-01. Presented at the IFT Annual Meeting (New Orleans, LA). July 22-24. 247. Hunt A, Park JW, Rolf D. 2014. Optimization of sodium reduction using various smart salt blends. Presentation # 108-02. Presented at the IFT Annual Meeting (New Orleans, LA). July 22-24. 248. Yin T, Park JW. 2014. Influence of nano-scaled fish bone on textural and rheological properties of Pacific whiting surimi. Presentation # 165-01. Presented at the IFT Annual Meeting (New Orleans, LA). July 22-24. 249. Liu Y, Park JW. 2014. Optimized calcium chloride addition and heating condition for Pacific whiting surimi. Presentation # 165-02. Presented at the IFT Annual Meeting (New Orleans, LA). July 22-24. 250. Yin T, Park JW. 2014. Optimum process of fish ball using Pacific whiting surimi. Presentation # 165-08. Presented at the IFT Annual Meeting (New Orleans, LA). July 22-24. 251. Kobayashi Y, Hunt A, Park JW. 2015. Value-added fish fillets with improved texture and calcium enrichment. Presented at the 66th Pacific Fisheries Conference (Astoria, OR). March 1-4, 2015. 252. Yin T, Park JW, Xiong S. 2015. Preparation and characterization of submicron fish bone. Presented at the 66th Pacific Fisheries Conference (Astoria, OR). March 1-4, 2015. 253. Moon JH, Yoon WB, Park JW. 2015. Texture properties of surimi-carrot gels at various linear heating rates. Presented at the 66th Pacific Fisheries Conference (Astoria, OR). March 1-4, 2015. 254. Park HW, Park JW, Yoon WB. 2015. Novel approach to determine an optimum formulation in surimi blend using critical moisture content and linear programming. Presented at the 66th Pacific Fisheries Conference (Astoria, OR). March 1-4, 2015. 255. Hunt AL, Draves R, Park JW. 2015. Alaska pollock fish oil refined for added health benefit in surimi seafood. Presented at the 66th Pacific Fisheries Conference (Astoria, OR). March 1-4, 2015. 256. Lee JH, Park JW. 2015. Effect of postharvest processing and storage conditions on the quality of frozen Pacific whiting fillets. Presented at the 66th Pacific Fisheries Conference (Astoria, OR). March 1-4, 2015. 257. Park HW, Park JW, Yoon WB. 2015. A novel algorithm to determine an optimum formulation in a Surimi Blend Using Critical Moisture Content and Linear Programming. Presentation #031-002. IFT Annual Meeting (Chicago, IL). July 11-14. 258. Park HW, Park JW, Yoon WB. 2015. Measuring Tensile Stress and Strain of Surimi Gels Using a Novel Ring Tensile Test With Image Analysis. Presentation #031-092. IFT Annual Meeting (Chicago, IL). July 11-14. 259. Moon JH, Park JW, Yoon WB. 2015. Assessing the Textural Properties of Surimi Gels Mixed With Carrot Cubes as Affected by Linear Heating. Presentation #031-011. IFT Annual Meeting (Chicago, IL). July 11-14. 260. Moon JH, Park JW, Yoon WB. 2015. Textural Properties of Canned Corn Embedded in Surimi Gels Prepared at Various Heating Conditions. Presentation #031-141. IFT Annual Meeting (Chicago, IL). July 11-14. 261. Lee MG, Park JW, Yoon WB. 2015. Rheological and Textural Characterization on the Gelation of Alaska Pollock Surimi under Various pH and Heating Conditions. Presentation #031-122. IFT Annual Meeting (Chicago, IL). July 11-14. 262. Lee MG, Park JW, Yoon WB. 2015. Thermal Properties of Alaska Pollock Surimi Paste as a Function of Moisture, Salt Contents, and Temperature. Presentation #031-149. IFT Annual Meeting (Chicago, IL). July 11-14. 263. Kobayashi Y, Park JW. 2015. Biochemical and Rheological Characterizations of Surimi and Fish Protein Isolate Made From Fresh and Frozen Whole Fish. Presentation #046-017. IFT Annual Meeting (Chicago, IL). July 11-14. 264. Kobayashi Y, Park JW. 2015. Gelation Properties of Tilapia Proteins in the Form of Surimi and Fish Protein Isolate Prepared During Rigor Mortis. Presentation #046-087. IFT Annual Meeting (Chicago, IL). July 11-14. 265. Junes KM, Park JW. 2015. Various Whey Protein Concentrates as Protease Inhibitors and Gel Enhancers in Pacific Whiting Surimi. Presentation #049-057. IFT Annual Meeting (Chicago, IL). July 11-14. 266. Fowler M, Park JW. 2015. Salmon Plasma Protein as Enzyme Inhibitor and Gel Enhancer Under Various Ohmic Heating Conditions. Presentation #049-057. IFT Annual Meeting (Chicago, IL). July 11-14. 267. Hunt AL, Park JW. 2015. Gelation Properties of Pacific Whiting Surimi Combined With Various Particle Sizes of Potato Extract. Presentation #067-053. IFT Annual Meeting (Chicago, IL). July 11-14. 268. Yin T, Park JW, Xiong S. 2015. Characteristics of Submicron Fish Bone Made From Fishery Byproducts. Presentation #095-007. IFT Annual Meeting (Chicago, IL). July 11-14. 269. Yin T, Park JW, Xiong S. 2015. Effects of Submicron Fish Bone and Its Particle Size on the Properties of Silver Carp Surimi Gel. Presentation #095-037. IFT Annual Meeting (Chicago, IL). July 11-14. 270. Lee JH, Park JW. 2015. Quality of Frozen Pacific Whiting Fillets as Affected by Postharvest Processing and Storage Conditions. Presentation #095-078. IFT Annual Meeting (Chicago, IL). July 11-14. 271. Park JW, Kim JS. 2015. Korean Seafood Products Imported to United States: Current Issues, Challenges, and Strategies. UKC Conference 2015. Atlanta, GA. July 30. 272. Lee JW, Park JW. 2016. The Effect of Various Postharvest Conditions on Physicochemical Properties of Alaska Pollock Subjected to Different Freeze/Thaw Cycles. The 67th PFT Annual Meeting (Blaine, WA). Feb 21-24. 273. Kobayashi Y, Park JW. 2016. Effect of Chopping Temperature and Time on Gelation Properties of Tilapia Fish Protein Isolate and Surimi. The 67th PFT Annual Meeting (Blaine, WA). Feb 21-24. 274. Lee JH, Park JW. 2016. Physicochemical Properties of At-Sea Frozen Alaska Pollock as Affected by Various Postharvest Conditions. Poster #1-004. IFT Annual Meeting (Chicago, IL). July 17. 275. Kobayashi Y, Park JW. 2016. Physicochemical Characterizations of Tilapia Fish Protein Isolate Under Various Comminution. Poster #1-005. IFT Annual Meeting (Chicago, IL). July 17. 276. Kobayashi Y, Park JW. 2016. Optimal Blending of Two Refined Fish Proteins Prepared Using Different Methods. Poster #2-001. IFT Annual Meeting (Chicago, IL). July 17. 277. Junes K, Park JW. 2016. Nutritional Values of Korean Gim (Sea Veggie) for American Consumers. Poster #2-002. IFT Annual Meeting (Chicago, IL). July 17. 278. Lee JH, Park JW. 2016. The Effect of Pre-Freezing Treatments on B-Season Frozen Alaska Pollock Fillets. Poster #2-004. IFT Annual Meeting (Chicago, IL). July 17. 279. Junes K, Park, JW. 2016. Heavy Metals in Korean Gim (Sea Veggie) for American Consumers. Poster #3-001. IFT Annual Meeting (Chicago, IL). July 18. 280. Park HW, Yoon WB, Park JW. 2016. Relationships Among Penetration, Tensile, and Torsion at the Fracture of Surimi Gels Under Image Analysis. Poster #3-002. IFT Annual Meeting (Chicago, IL). July 18. 281. Hunt A, Park JW. 2016. Altering Batter Formulation to Reduce Fat Content of Fried Seafood. Poster #5-002. IFT Annual Meeting (Chicago, IL). July 19. 282. Jung HB, Yoon WB, Park JW. 2016. Measuring the Mechanical Properties of Dried Gim (Korean Sea Veggie) as Affected by Relative Humidity Using a Ring Tensile Test. Poster #5-005. IFT Annual Meeting (Chicago, IL). July 19. 283. Park HW, Yoon WB, Park. 2016. Heat and mass transfer simulation based on moisture evaporation and temperature distribution during temperature sweep. Poster #6-002. IFT Annual Meeting (Chicago, IL). July 19. 284. Supawong S., Thawornchinsombut S, Park JW. 2017. The cryoprotective and antioxidant properties of rice bran hydrolysates in frozen Pacific whiting washed mince subjected to different freeze-thaw cycles. Presented at the 68th PFT Conference. Vancouver, Canada. Feb 5-8. 285. Hunt A, Draves R, Park JW. 2017. Improved health benefit using Alaska pollock fish oil as a functional ingredient in surimi seafood. Presented at the 68th PFT Conference. Vancouver, Canada. Feb 5-8. 286. Junes K, Hunt A, Park JW. 2017. Utilization of nano-scale fish bone for gel enhancement of Alaska pollock surimi. Presented at the 68th PFT Conference. Vancouver, Canada. Feb 5-8. 287. Sripitak N, Park JW. 2017. Surimi Industry in Thailand: Past, Present, and Future. Presented at the 68th PFT Conference. Vancouver, Canada. Feb 5-8. 288. Lee JH, Peng Y, Heidolf B, Park JW. 2017. The activity of TMAOase affecting the quality of frozen Alaska pollock surimi by various sodium phosphates. Presented at the 68th PFT Conference. Vancouver, Canada. Feb 5-8. 289. Lee JH, Park HW, Jenkins R, Park JW. 2017. Image and chemical analysis for freezing-induced aggregates of fish natural actomyosin as affected by various phosphate compounds. Presented at the Poster #P02-001. IFT Annual Meeting (Las Vegas, NV). June 26. 290. June K, Hunt A, Park JW. 2017. Optimization of wet milling parameters for nano-scaled fish bone. Presented at the Poster #P02-003. IFT Annual Meeting (Las Vegas, NV). June 26. 291. Kobayashi Y, Park JW. 2017. Protective effects of sorbitol, trihalose, and sodium lactate against pH-induced fish protein unfolding. Presented at the Poster #P02-004. IFT Annual Meeting (Las Vegas, NV). June 26. 292. Hunt A, Park JW, Boyd D. 2017 Evaluating effectiveness of potato protein powder for use in clean label seafood patty formulation. Presented at the Poster #P02-001. IFT Annual Meeting (Las Vegas, NV). June 26. 293. June K, Hunt A, Park JW. 2017. Citrus fiber as an effective fat blocker in fried seafood. Presented at the Poster #P03-001. IFT Annual Meeting (Las Vegas, NV). June 27. 294. Jung HB, Yoon WB, Park JW. 2017. Effects of potato protein isolated using ethanol on the gelation and proteolytic properties of Pacific whiting surimi. Presented at the Poster #P03-002. IFT Annual Meeting (Las Vegas, NV). June 27. 295. Jung HB, Yoon WB, Park JW. 2017. Ultrasonic treatment enhances the protease inhibition activity of potato used in Pacific whiting surimi. Presented at the Poster #P03-005. IFT Annual Meeting (Las Vegas, NV). June 27. 296. Supawong S, Thawornchinsombut S, Iuchi Y, Park JW. 2017. Rice bran hydrolysates reduce browning reaction and function as endogenous antioxidant enzymes in wild type-mouse embryo fibroblast (WT-MEF) cells. Presented at the Poster #P04-009. IFT Annual Meeting (Las Vegas, NV). June 28. 297. Lee J, Peng Y, Heidolph B, Park JW. 2017. Physicochemical properties of frozen Alaska Pollock fillets as affected by various sodium phosphates. Presented at the Poster #P04-004 IFT Annual Meeting (Las Vegas, NV). June 28. 298. Kim IH, Hunt AL, Kim HJ, Park JW. 2018. Purification of Alaska pollock fish bone for preparing nano-scale fish bone slurry. Presented at the 69th Pacific Fisheries Technologists Conference, Girdwood, AK. Feb 4-7, 2018. 299. Kim HJ, Supawong S, Park JW. 2018. ​Minimizing setting effect of surimi paste made of Alaska pollock surimi. Presented at the 69th Pacific Fisheries Technologists Conference, Girdwood, AK. Feb 4-7, 2018. 300. Supawong S, Thawornchinsombut S, and Park JW. 2018. Fat blocking phenomenon by the function of fish proteins. Aquatic Food Products Division. Poster Session 5: S406. IFT Annual Meeting (Chicago, IL). July 18. 301. Yoo JS, Kim HJ, Kim IH, Hunt AL, and Park JW. 2018. Optimizing fish bone treatment for maximizing calcium content and gel enhancement when added to Alaska Pollock surimi. Aquatic Food Products Division. IFT Annual Meeting (Chicago, IL). July 18. 302. Park JW, Yoo JS, Kim HJ, Min BC, and Kim IH. 2019. A role of arginine as sodium phosphate replacement in surimi processing. PFT Annual Meeting (San Carlos Nuevo Guaymas, Mexico). Feb 24-27. 303. Hunt AL, Park JW. 2019. Utilization of submicro-scale fish bone in Alaska pollock fillets for improved quality. PFT Annual Meeting (San Carlos Nuevo Guaymas, Mexico). Feb 24-27. 304. Jung H, Park JW, Yoon WB. 2019. Repeatable dual extrusion cell: a novel device to measure texture characteristics of surimi gels from the first bite to the point of swallowing. PFT Annual Meeting (San Carlos Nuevo Guaymas, Mexico). Feb 24-27. Park, J.W. 1993. Functional properties of Pacific whiting surimi. NE-123 (Functional Properties of Protein Foods), USDA Regional Research Committee, Uni. of Rhode Island, Kingston, RI, Oct. 3-5. Park, J.W. 1994. Ohmic heating for protein gelation. Presented at the NE-123 (Functional Properties of Protein Foods) meeting, USDA Regional Research Committee, U. of Kentucky, Lexington, KY. September 24-26. Yoon, W.B. and Park, J.W. 1996. Development of linear heating using water bath. Presented at the NE-123 meeting, USDA Regional Research Committee, Oct. 6-7, Ross Lab, Columbus, Ohio. Yoon, W.B., Park, J.W., and Kim, B.Y. 1996. Rheological characteristics of fiberinogen-thrombin solution in surimi gels. Presented at the NE-123 (Functional Properties of Protein Foods) meeting, USDA Regional Research Committee, Oct. 6-7, Ross Lab, Columbus, Ohio. Park, J.W. 1998. Development of linear heating using ohmic heating and water bath. Presented at NE-123 meeting, Atlanta, GA. June 24. Park, J.W. 1999. Gelation Properties of Fish Proteins. Functional Food System Symposium. Chicago, IL. July 27-29. Park, J.W., Lakkis, J. 1993. Technical Session: Protein-Processing, Properties-II. Session 49. IFT Annual Meeting (July 10-14, 1993). Chicago, IL. Park, J.W., Farkas, D.F. 1997. New Products & Technologies Session I: Session NPT1. IFT Annual Meeting (June 14-18, 1997). Orlando, FL. Park, J.W. 1997. Seafood Biochemistry. 48th Annual Meeting, Pacific Fisheries Technologists (April 20-23, 1997). Park, J.W., Green, D.P. 1999. Technical Oral Session: Seafood Technology. Session 35. IFT Annual Meeting (July 24-28, 1999). Chicago, IL. Park, J.W., Morrissey, M.T. 2000. Technical Oral Session: Seafood. Session 75. IFT Annual Meeting (June 10-13). Dallas, TX. Park, J.W., Regenstein, J.M. 2001. Symposium - Food Byproducts and Waste Utilization. Session 82. Chaired at the IFT Annual Meeting (June 23-27, 2001). New Orleans, LA. Park, J.W. 2002. 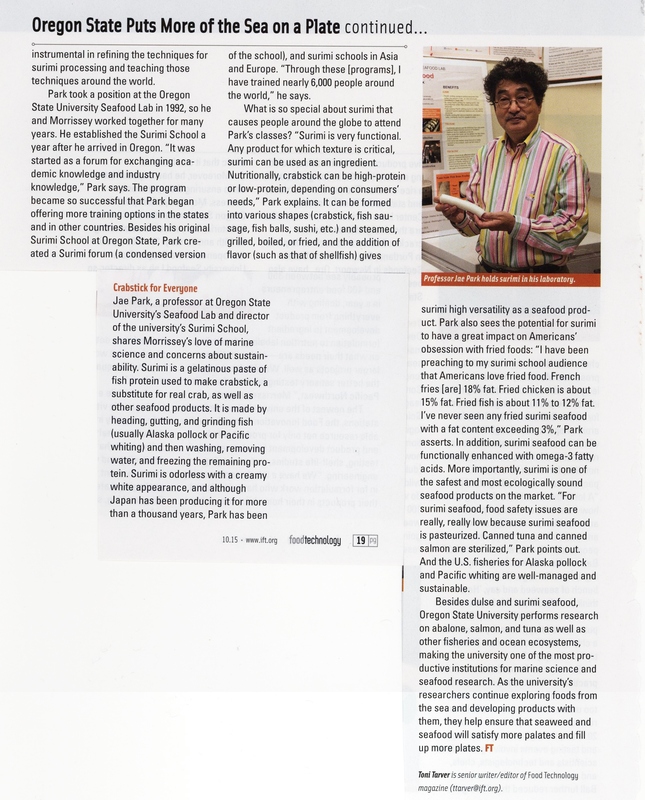 Session 8 – Processing and Technical Innovations with Aquatic Food Products – the 53 Pacific Fisheries Technologists (Reno, Nevada). Feb 24-27. Park, J.W., Kristinsson, H.D. 2002. Technical Oral Session: Seafood Technology: Safety. Session 44. IFT Annual Meeting (June 15-19, 2002). Anaheim, CA. Park, J.W. 2003. Poster session. Presented at the 54th Annual Meeting of Pacific Fisheries Technologists, Astoria, OR. February 23-26. Park, J.W., Rippen, T.E. 2003. Technical Oral Session: Aquatic Food Products: Surimi and Proteins. Session 40. IFT Annual Meeting (July 12-16, 2003). Chicago, IL. 11. Park, J.W. 2006. Session I (Color Measurement/Meats and Seafoods), Color Quality of Fresh and Processed Foods. The 231st American Chemistry Society National Meeting. Atlanta, GA. March 26-30. 12. Park JW. 2009. Group Session 1 (Seafood Chemistry & Seafood Processing Technology), at the Int’l Seafood Processing Technology and Safety Control System Conference. Ocean University of China, Qingdao, China. Oct 31 – Nov 2. 13. Park JW. 2011. Chaired a session "Driving trends in aquatic food market at ASEAN Food Conference 2011 (Bangkok, Thailand). 14. Park JW. 2019. Chaired a session “Seafood Chemistry and Biochemistry”. The 70th PFT Annual Meeting (San Carlos Nuevo Guaymas, Mexico). Feb 24-27. 1. Symposium – Surimi and Fish Mince Technology. The11th World Congress of Food Science and Technology (April 26-30, 2001). Seoul, Korea. 2. Symposium – Fish Protein Recovery using pH Shift. IFT Annual Meeting (July 12-16, 2004). Las Vegas, NV. 1. IntraFish. School where surimi is king. p20-21 August 2006. 2. Oregonian. Scientists transform fishy mush into money maker. Science Section. Aug 13, 2006. 3. Seafood Processor: World surimi school schedule announced. Oct 2006. 4. Oregon’s Ag Progress. Welcome to Surimi School. Vol 53, No 1. Summer 2007. 5. IntraFish: Surimi crisis – How bad will it get? May 2008. 6. The Daily Astorian: Researchers hustle as crisis threatens. July 15, 2008. 10. Seafood Executives – 100 Global Seafood Power Executives. Jan 2012. 12. Fat blocking by SeafoodSource.com (Sept 25, 2012). 14. 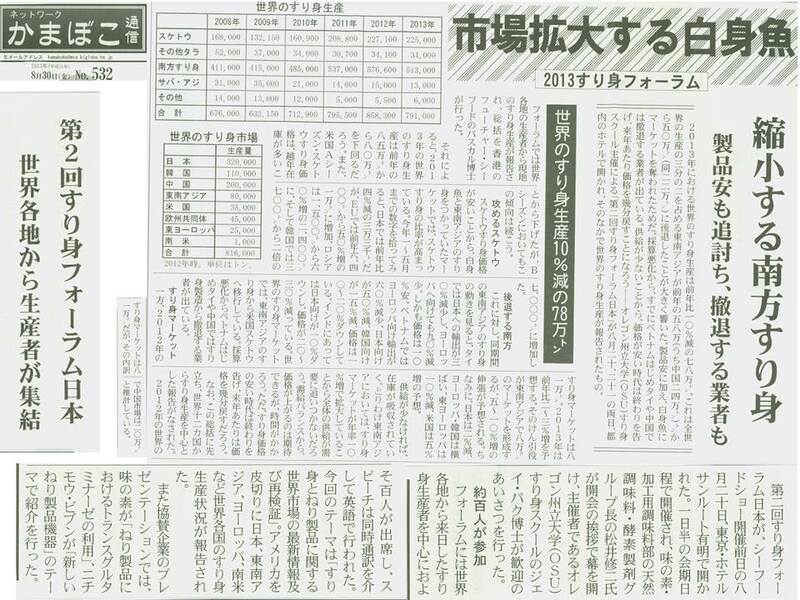 Minato Shinbun (Japan) – Surimi Forum Japan. Aug 22, 2013. 15. Thrillist Magazine: The one ingredient secretly in a ton of the seafood you eat. Jan 27, 2017. What's better - Real Crab or Real Krab? 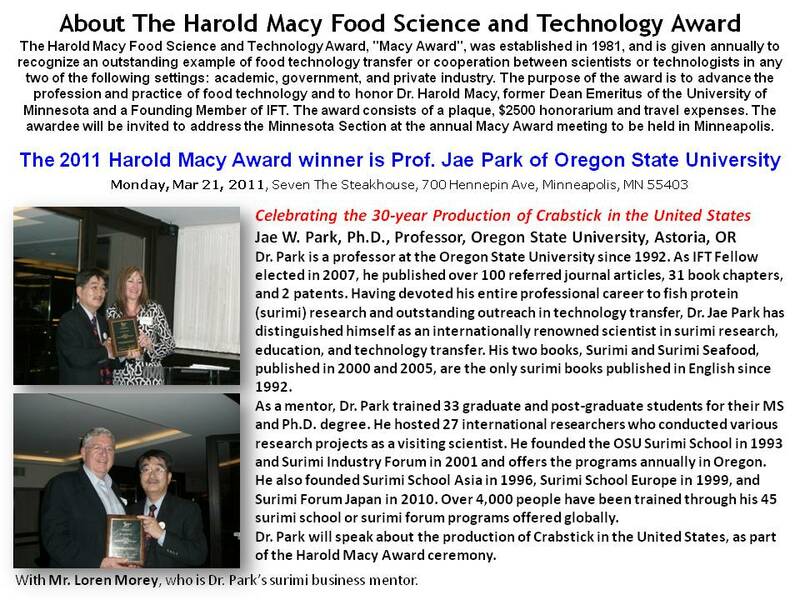 Dr. Jae Park - OSU Who's who?